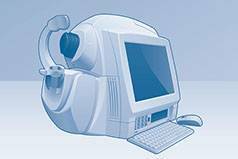 A computer that helps improve accuracy when determining your final glasses or contact lens prescription. It is especially useful for those who may not be responsive to a manual refraction. 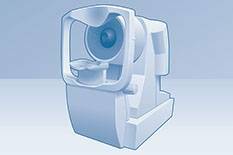 Allows your doctor a highly magnified view of your eye to thoroughly evaluate the front structures of your eye (lids, cornea, iris, etc. ), followed by an examination of the inside of your eye (retina, optic nerve, macula and more). This test aids the doctor in the diagnosis of cataracts, dry eyes, corneal irritation, glaucoma and age-related macular degeneration. Offers a wider view of the eye’s internal structures, including examination of the central and peripheral retina (thinning, holes, tears, diabetes-related side effects) by using eyedrops to enlarge your pupils. Photographs the retina and optic nerve (located in the back of the eye) to document the health of your eye. These images are used for the diagnosis of glaucoma, macular degeneration, diabetic eye disease, high blood pressure-related disease and other retinal diseases. A computer that measures the pressure inside of the eye to determine one of the risks for developing glaucoma. If the pressure is high, an additional test may be used. Checks for the presence of blind spots in your peripheral, or “side”, vision. These types of blind spots can originate from eye diseases such as glaucoma. Analysis of blind spots also may help identify specific areas of brain damage caused by a stroke or tumor. It is mainly used by optometrists and opticians to verify the correct prescription in a pair of eyeglasses, to properly orient and mark uncut lenses, and to confirm the correct mounting of lenses in spectacle frames. Lensometers can also verify the power of contact lenses, if a special lens support is used. Assesses depth perception and determines if eyes are working together. It is especially useful for identifying “lazy eyes” in children, which can be treated if identified while they are young. Evaluates color deficiencies in the eyes (red/green or blue/yellow) by asking you to pick out numbers from colored mosaic-like illustrations. In addition to detecting hereditary color vision deficiencies, the results may also alert your doctor to possible eye-health problems that could affect your color vision. Creates a “map” of the surface curvature of the cornea, similar to making a contour map of land. Using computerized imaging technology, the three-dimensional map produced by the corneal topographer aids in the diagnosis, monitoring and treatment of various visual conditions including astigmatism. 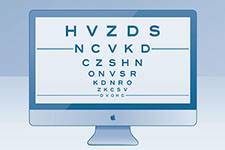 A standard eye chart that measures the sharpness of your vision. Evaluates how well your current glasses or contact lenses are working, and if you need an updated prescription. Uses a paddle to cover one eye at a time to help evaluate eye muscles. Can catch tendency toward crossed eyes in children. Evaluates for any indications of eye strain, which could be the result of strabismus or amblyopia. Fine tunes your eyeglass prescription along with other tests. The doctor places an instrument called a phoropter (rotating lenses) in front of your eyes, which allows you to look through a series of lenses to determine which is clearest. The refraction determines your level of hyperopia (farsightedness), myopia (nearsightedness), astigmatism and presbyopia. Evaluates multiple elements including the shape of your eye, your vision correction needs and how often you will use the lenses. If you’ve never worn contact lenses, your eye-care professional will show you how to use your lenses and how to take care of them. Measures the thickness of the cornea. Conventional pachymeters use ultrasonic transducers that touch the cornea. Newer generations work by way of sound waves that capture an ultra-high definition echogram of the cornea. 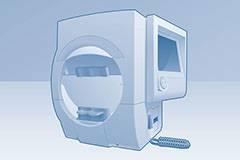 Corneal pachymetry is an important test in the early detection of glaucoma. and follow treatment in certain eye conditions and diseases, such as age-related macular degeneration, glaucoma and diabetic retinopathy.